The Mirus Index is a benchmark that includes about 5,000 restaurants of all types; from fine dining to pretzel shops. 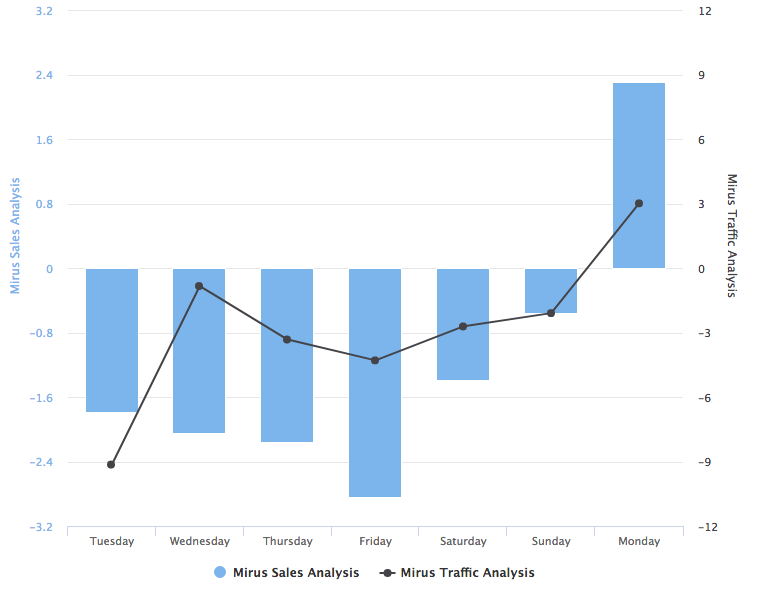 Clients of Mirus use it to compare their comparable sales and traffic numbers and determine if their company is outperforming the market in general. Rarely does the Index stay positive or negative, every day, for a long period of time. July started out with a great 4th of July long weekend, and same store sales were up compared to the same days last year. Every day after the 4th was negative, as you can see. The sales declines ranged from very small to -5% or more. If you focus on the last week of the month, the average decline seems to be increasing. Is there any good news in July? We looked at days of the week to see which days took the biggest hit. And, surprise, the big increase on Monday July 3 was large enough to make Monday the only day of the week with both increased customer traffic and same store sales. The big sales decline on Friday is particularly worrisome as it is the second or third best day for many restaurants. We will keep an eye on the other industry benchmarks as they come out over the next few weeks to see how Mirus Index compares, but it looks likely that July will not be celebrated as the start of the turn-around. If you would like to learn more about Mirus and the services we provide multi-unit restaurant companies, please click below. Mirus is a multi-unit restaurant reporting, analytic and predictive software solution set used by operations, finance, IT, and marketing to gain deeper insights into the business.